Doogee has been slinging affordable smartphones since 2013. For the most part, they haven't been anything to write home about—rectangles with screens and cameras, like so many others. But YouTuber Mrwhosetheboss got his hands on a prototype of the Doogee Mix 4, and it's certainly striking, with teeny tiny bezels on all sides of the display and a sliding design to hide the earpiece and front-facing camera. We've seen leaked photos of the device, but this is the first time it's been shown on video. The unit in the video is a dummy, but there's still plenty to see. The 6-inch screen is about as close to bezel-less as we've ever seen; Mrwhosetheboss estimates the screen-to-body ratio at "about 97 percent." The bezels aren't big enough to house the requisite hardware for normal smartphone functions, and there's no notch—the back half of the phone slides up to reveal the earpiece and selfie shooter. The sliding motion could be set to perform useful actions like answering an incoming call or opening the camera app to the front camera's view, although having the sensors hidden most of the time could make automatic brightness adjustment tricky. There's an icon on the "screen" that suggests there will be an in-glass fingerprint sensor in the production model. The rest of the hardware is pretty standard. The power and volume buttons are on the right-hand side, and there are bottom-facing grilles for the speaker and microphone flanking what will presumably be a USB-C port. 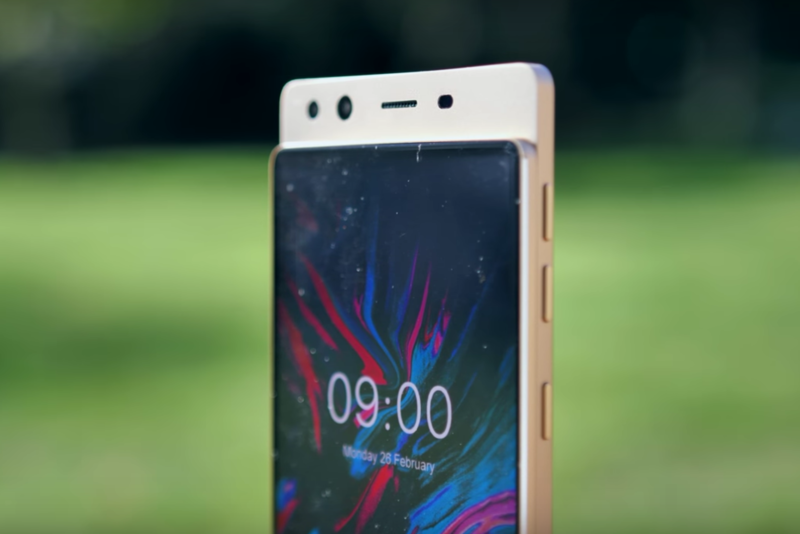 There are dual cameras around back, and nothing that looks like a headphone jack is present on the model—which makes sense, given the Doogee Mix 2 didn't have one, either. The Mix 3 isn't even available yet; it's expected to be out sometime this year, and the Mix 4 should follow some months later. The Mix 4 will apparently use a Snapdragon processor, but it's unclear which. The Mix 4 should retail for less than $300, which, given the novel hardware, would be impressive. Sliding phones have been around forever, but we haven't seen this type of implementation before. It seems like a pretty elegant play in the bezel-elimination arms race.